If you’re in the business of writing, or if you’ve explored digital marketing for your business, chances are you’ve probably heard the term ‘SEO content’ used a couple of times. But what is ‘SEO Content’ exactly? SEO, or search engine optimization, is the practice of making your website, and its content, optimized for search engines like Google to be able to easily identify what your website is about. Basically, it’s the art of making sure your site comes up higher in search rankings than your competitors. Those methods tended to lead people to a lot of spammy sites. In response, search engines have started looking at other factors to determine whether your site is relevant. Broadly speaking, they’re looking for quality, not just relevant keywords. Today, blogs or articles are some of the most successful content marketing tools, but it is important that they are created with SEO in mind. Length, voice, and titles are just some of the factors that play into the SEO-friendliness of content, but once you get the hang of it, you’ll be making your way to the top of the search results. When writing content, it’s all about quality over quantity, but there are some general guidelines to keep in mind. People often search the internet for quick, easy answers, but they also want to feel confident in the information they are reading. Ideally, you’ll want to shoot for somewhere between 800 and 1700 words. This is long enough to provide the information readers need, but short enough to hold people’s attention. When it comes to SEO, the structure of your blog is just as important as the content. Search engines rely on key structural elements like the page title, headers, URL, meta description, and content titles to determine what your content is about, and when to show it to searchers. It’s best practice to include your focus keyword naturally throughout the body of your content, but it is especially important to include it in the Page Title, H1, URL and meta description. This will let readers and search engines know exactly what to expect from each section. Make sure you only have one H1 per content piece and use H2s and H3s for any relevant subheadings. Using images or videos to break up walls of text is a great way to improve the readability of your blog and make it more interesting for readers. If you’re including rich media content within your blog, take advantage of the title, caption, and alt-text and include the focus keyword. Search engines may not be able to see your images, but they can read the descriptions. Avoid overusing the passive voice in your writing. Instead, opt for writing in the active voice. It can make content easy to digest and to understand. On the other hand, using the passive voice can make content feel very distant to the reader, as it can sometimes lack clarity around who or what is performing an action. For example, instead of saying “ The blog is reviewed by an editor” you would say “An editor reviews the blog.” Doesn’t that sound much more clear? The Yoast SEO plugin for WordPress is a great tool to help you determine if you’re overusing the passive voice in your content. When creating content that you want your audience to connect with, it's best to keep things clear. Avoid overcomplicating things and instead stick to plain, simple language. Aside from making content easily digestible for your readers, it can also help search engines understand and distribute your content more effectively. Notice how the message on the right conveys the exact same information, without using too many words or repetitive statements. Generally, a good guide to follow is to write as if you were having a regular conversation with a friend or colleague, the more natural you sound, the more readers will connect with your content. Writing short sentences is another way to improve the readability and SEO value of your content. Long sentences can ramble on forever, and readers can have a hard time understanding what you’re trying to say when your sentence goes on and on without end. Instead, break down complex thoughts or ideas into shorter sentences and connect them using transition words. After years of exposure to the internet, TV, and a constant stream of content, experts recommend that the average sentence length should be somewhere between 14 and 18 words. While it’s important to mix things up, aim for keeping a majority of your sentences under 20 words. The Yoast SEO plugin can evaluate your content for readability, including the average sentence length in a piece of content. Going back to the importance of the structure, you’ll want to utilize white space and short paragraphs to improve the readability of your content. Even if you have a lot to say, short paragraphs are easier to read. Lots of white space on the page makes it easier on the eyes and keeps people scrolling. In turn, this can help readers stay longer on your site reading your content and possibly read more than 1 page, reducing bounce rate. Ultimately, reducing bounce rate can help your content rank higher organically. Notice how the second example breaks down the same paragraph into 3 shorter paragraphs. This helps to improve the readability, especially for users who skimming for main points or reading your content from their mobile devices. Every blog or article you create should focus on a target keyword or keyword phrase that you are trying to rank for. Make sure to include your focus keyword in your main header (the article’s title). This helps with SEO by letting search engines know what the article is focusing on. For example, let’s say you’re the content manager for a university and you want your school to rank for the term ‘biomedical sciences,’ so you plan to write a blog about what makes a biomedical science degree so valuable. Your blog title might be something like ‘Everything You Need to Know About Studying Biomedical Sciences.’ Including the focus keyword in the title (H1) gives search engines like Google a clear understanding of what your blog is about. Breaking down your content with subheadings goes back to readability. Users should be able to navigate through your blog while clearly understanding what each section will be about. When it makes sense, you should also use your focus keyword in your subheadings. Headings are weighted more heavily than text when search engines crawl your site. Using keywords there can help boost your ranking. Using the ‘biomedical sciences’ example, your blog might include a subheading like ‘Top Career Opportunities in Biomedical Sciences.’ This would allow you to naturally use your keyword, add clarity for the reader, and allow search engines to crawl and understand your content, further boosting its SEO value. That said, there’s no reason to limit yourself to headers. You should aim to use your target keyword within the first 100 words of your content. You should also use your main keyword and a few related keywords throughout your article. This should flow naturally. For example, let’s say I’m currently optimizing for the keyword “SEO writing”. If I did my SEO writing so that I said SEO writing every chance I had a chance to say SEO writing, it would sound forced. Nobody wants to read that. There are two kinds of links that you’ll want to include throughout your content. Internal Links: Include links back to any related posts or service pages from your own domain. 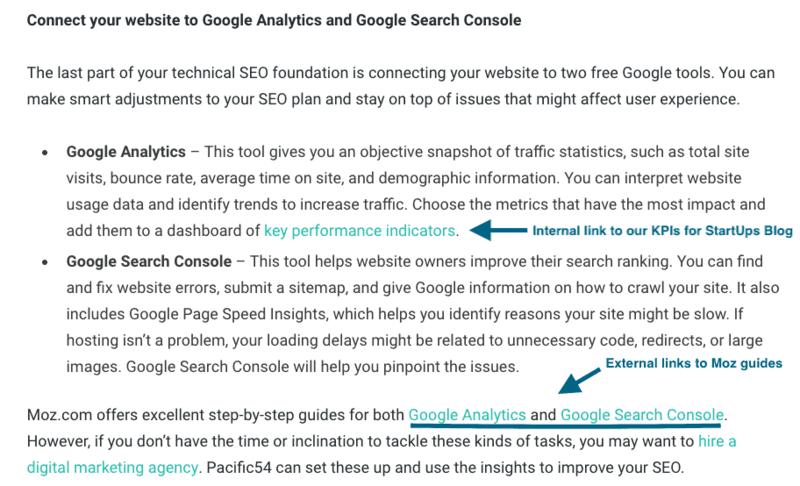 This helps search engines connect and understand the value of your content and understand the structure of your website. External Links: The more times your page links to related sites, the more relevant it will be to your readers’ search. Relevance also helps boost your rankings. Keep in mind, you want to link to credible, reputable sites, and you’ll definitely want to avoid linking to direct competitors. Images are another great way to help break up the text, they improve readability and the overall user experience. You can also boost your blog or article’s SEO by taking advantage of the caption and alternative text fields. The alt text field should be descriptive of the image and include the focus keyword when relevant. 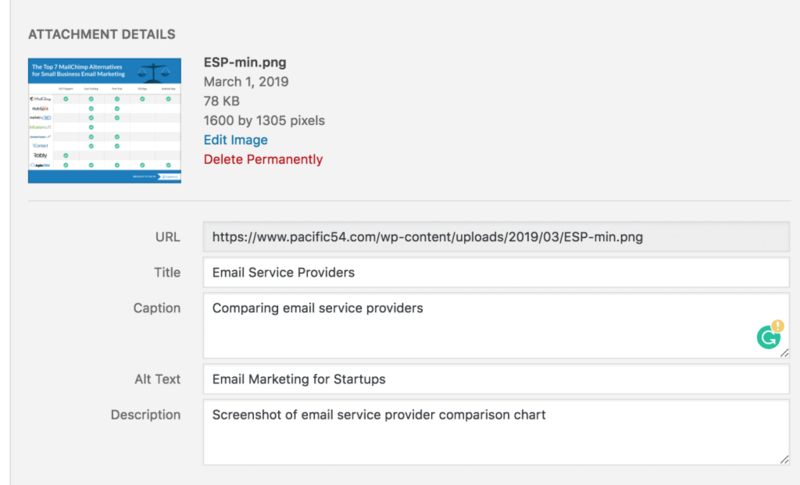 Here’s an example of image optimization in WordPress. After embedding an image within a blog post, open the edit screen to add a caption and alt text to your image. Make sure your images are supporting your content and adding value to the reader. The longer readers stay on the page and interact with your content, the better search engines will rank your content. If you don’t have a budget to buy images for each piece of content, don’t fret, you can use sites like Unsplash, Pexels, and Pixabay to find tons of images and videos that are free to use for commercial use. Search engines are looking for the value in each piece of content they crawl. Remember, the ultimate goal of search engines is to provide the best experience for users, you want to make sure your content useful, informative and credible. 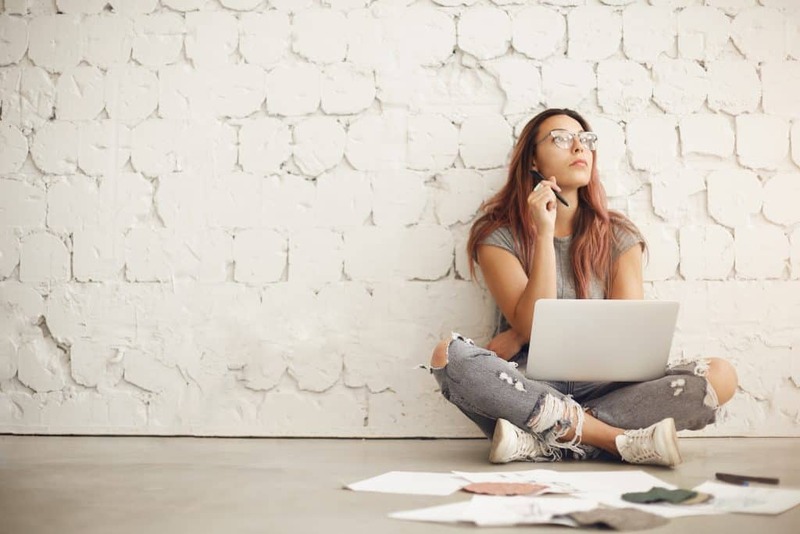 If your writing is full of generalities but doesn’t mention any concrete examples, readers can have a hard time connecting, or worse, they may think that you’re just blowing smoke. The more specific your language, the better. Not Ready For All This? Get Help. To help you out, we’ve created a simplified, downloadable version of this checklist just for you. Keep it with you each time you’re working on a new piece of content so you don’t leave anything out. If you’re running your own business, this may seem like more work than you’re willing to put into SEO writing. After all, you have more important things to do with your time, like serving your existing customers. There are many online marketing companies out there who can help get your site noticed. At Pacific54, our experts can help you take your SEO content writing to the next level. Interested? Contact us today!